I have asked my 16 year-old son, Vincent, to write some book reviews. He is very well-read for his age, and can always be found with at least one book in hand. He has been known to walk into inanimate objects because he had his nose in a book. He prefers fantasy books, but has read a lot of other styles. What follows are his words. Enjoy! Basic Protagonist – This story has dual protagonists. The first is Alex, who is intelligent and faithful, and timid in all matters except when it counts, when he steps up to the plate quite bravely and does what needs to be done. The second is Devyn, who is brave, daring, impetuous, and loving. The classical gender roles are flipped in this series, with the girl always being the first to do something brave and the boy tending to hang back. Basic Story – This series is about an altered version of World War I, in which the main characters are the fictional son of the assassinated duke who started the whole thing, and a British girl masquerading as a boy so she can serve in the army. The War is mainly fought between the Clankers, who use metallic walkers and war machines, and the Darwinists, who use genetically modified animals as weapons, such as a giant whale-hybrid filled with helium that’s used as an air machine. Possible Problem Areas – First of all, the heroes’ side of the war is based off an extended version of the theory of evolution. The concept is that Darwin discovered DNA and figured out how to manipulate the genetic strands to make new creatures. Secondly, one of the main characters for most of the book disguises herself as a boy so she can join the army. This results in a couple of awkward moments. For instance, when a doctor accidentally brushes her chest when she’s disguised as a boy, he has to feel her chest to make sure she isn’t concealing a bomb, but it’s done very clinically with no detail whatsoever. Also, in the books’ first installment, her brother tells her she shouldn’t have any trouble hiding her chest because her breasts are so small, but it’s done in a very light, joking way, specifically designed not to be serious or troublesome. There is some violence, with battle being viewed from a distance and airplanes using machine guns. Only a couple of known characters die throughout the series, although an insane unknown soldiers die nongraphically. Animals sustain most of the injuries in the series, although the most important animal, the airship whale, doesn’t die. Various minor animals die in battle, though. There are a few kisses throughout the series, and some romantic attraction between the two main characters. Good Areas – The story basically rewrites history, and it’s very interesting to see how it does so. Several characters from real life can be recognized, but in such strange contexts that you really can’t think of them as the historical person. So even though you could call it a historical story, it really is not, but is in an alternate universe. It’s amazing to think all the different kinds of animals that the author can imagine up, and with the occasional drawing, to see what they would look like. The story is captivating, and the intensity of emotion the characters feel is energizing. 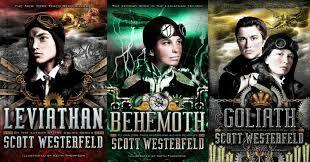 I don’t normally reread series, but this one I have read several times, so captivating are the story and characters. So with all this in mind, I give the series 5 stars for being an amazing series. Basic Protagonist – The hero is a spunky pickpocket who, because of his circumstances, has had to learn how to steal and hedge the truth. He does have morals, though, hating to lie and being faithful to his teacher and friends. While a rascal and a scamp, he is for the most part an all around good person. Basic Story – A street pickpocket steals a magician’s magical stone from his pocket, and the magician takes him on as his apprentice while he tries to figure out what is wrong with the city’s magic. 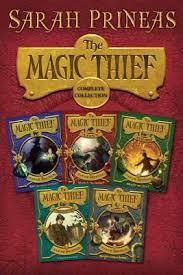 The rest of the series deals with the boy trying to solve the magic’s problem and his relationship with magic developing. Possible Problem Areas – Not much violence. The hero gets into a fight, but come out alive; a boy is beaten by bad guys, but doesn’t die; and a man who eventually becomes the hero’s friend at first smacks him whenever he does something stupid, but it’s not half as bad as it sounds, and is played for comic rather than serious effect. There is a lot of magic in the book, but it isn’t dark, and in fact is a rather original take on the theory of magicians. An evil magic lives distraught, and it is eventually revealed that the reason it is evil is actually grief that it received as an animate creature, and the dark magic is reconciled in the end. No romance. Good Areas – The author has a humorous style of writing, and somehow manages to expertly conceal things from the reader that the main character knows, and yet she keeps you well in touch with the main character, feeling what he feels. The book is humorous and light, designed for preteens or maybe even younger. I can’t find anything else tangible to compliment the author for, but it does have something, and that something makes it a very good book, and easily deserving of its 4 ½ star rating.